St. Helier is the capital and retail center of the Isle of Jersey. One of 12 parishes on the island, it is perhaps the most urbanized area in the Channel Islands. Charming Betty and Charming Nancy run to and fro. 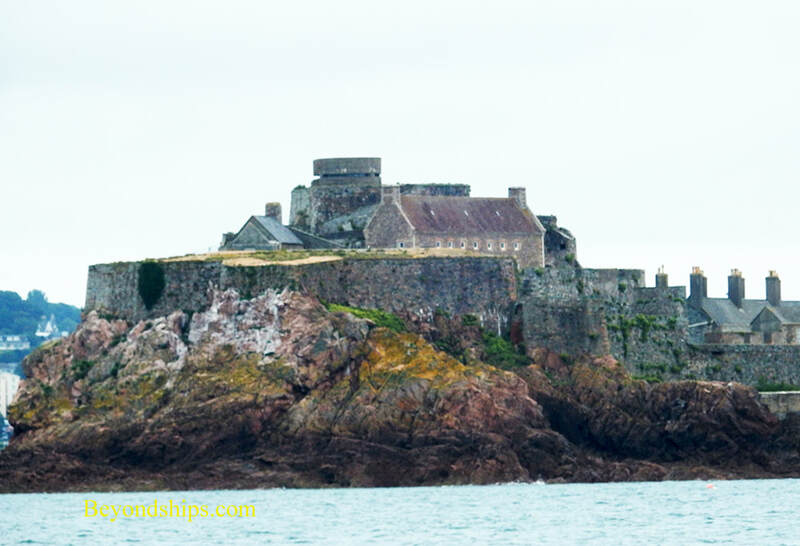 The islet is believed to be the site of the hermitage of St. Helier, a 6th century Belgian monk who came to preach on the island and was beheaded by pirates. He is the patron saint of Jersey. Subsequently, a priory existed on the islet but that was confiscated by the Crown during the reformation. Construction of the Castle began in 1594. Shortly thereafter, it was named after Queen Elizabeth I by Sir Walter Raleigh when he was governor of the island. The Castle saw fighting both during the English Civil War when it was successfully besieged by Parliamentarian forces and in 1781 when it was attacked by the French. ​During World War II, the Germans modernized the fortifications and built gun emplacements. The Castle is open to the public. 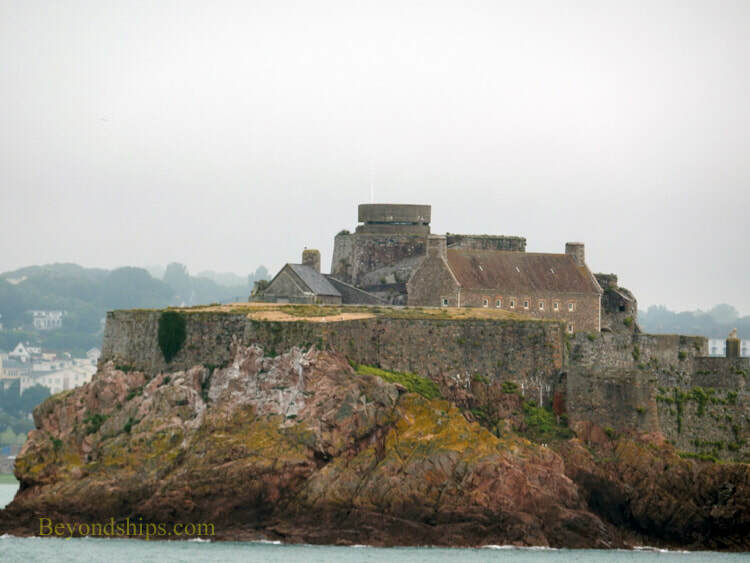 Overlooking St. Helier from Mont de la Ville is Fort Regent. Following the French attack and the Battle of Jersey in 1781, it was decided that Castle Elizabeth did not provide sufficient defense for the city. Therefore plans for a fortress on Mont de la Ville were devised. Construction began in 1804. The fortress was named after the Prince Regent. Fort Regent became the main British Army fortress and barracks on the island. 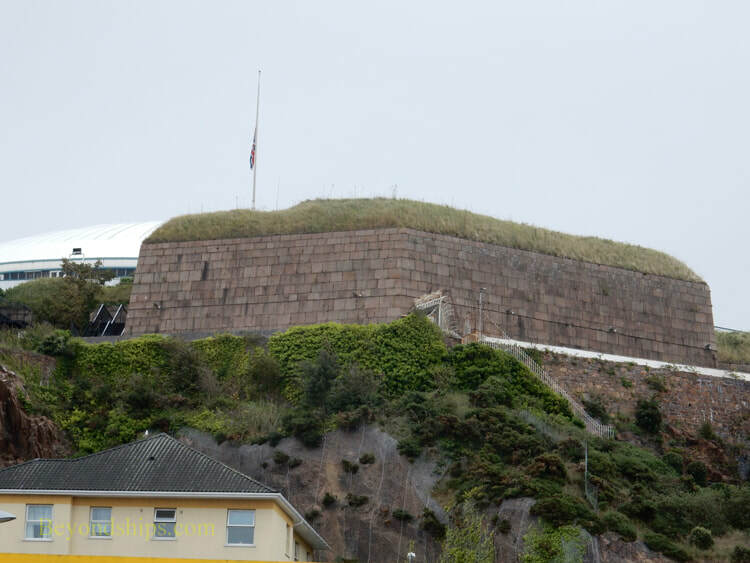 However, the only time it fired shots in anger was during World War II when the Germans used the fort as an anti-aircraft installation. The site is now a leisure center. However, sections of the walls as well as the signal masts are still visible. 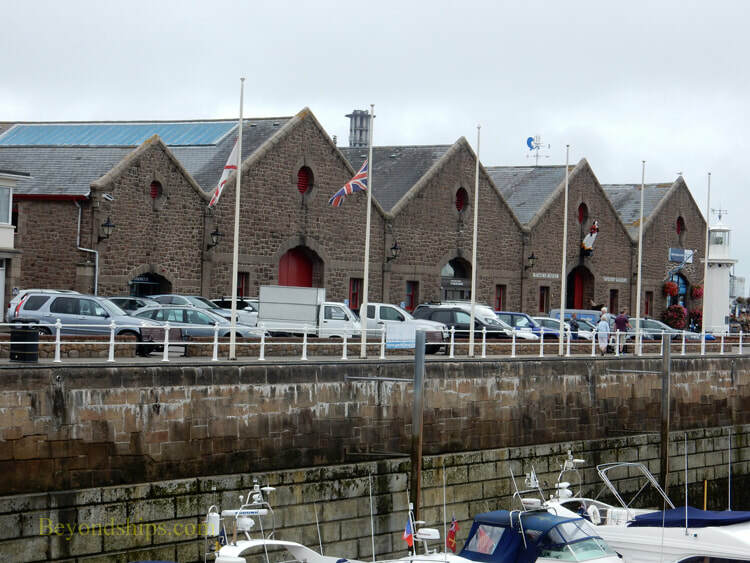 The Jersey Maritime Museum is located just across the marina from where the cruise ship tenders dock. Its focus is on the marine environment and the people of Jersey's relationship to the sea. Housed in four historic warehouses, each of the three large warehouses focuses on a different aspect of the maritime world. One emphasizes the elements – tides, wind and waves. The next looks at boats and how people travel on the sea. The third is about the relationship between the people of Jersey and the sea. The smaller warehouse is used for exhibit space. Visitors can also see classic boats being restored. Also housed at the Maritime Museum is the Occupation Tapestry. Created to celebrate the 50th anniversary of the end of the German occupation, the tapestry depicts islanders' memories of that time. 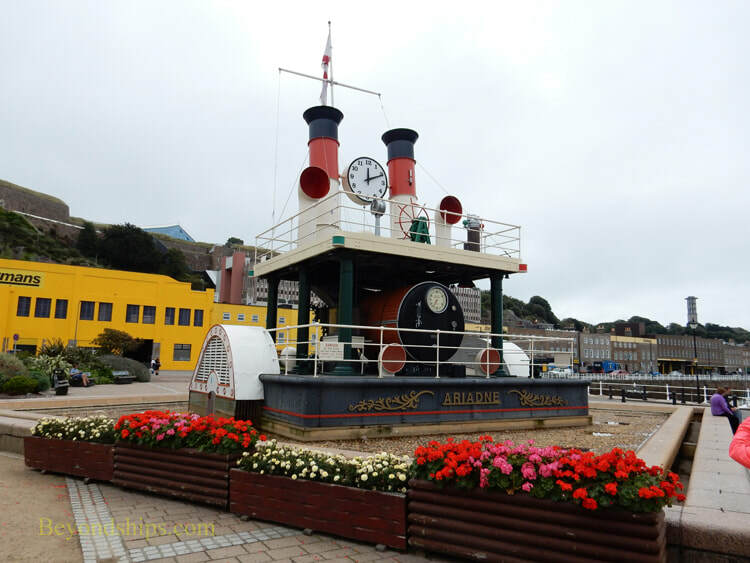 In back of the museum is a steam-powered clock, which uses the steam engine from a ship for power. 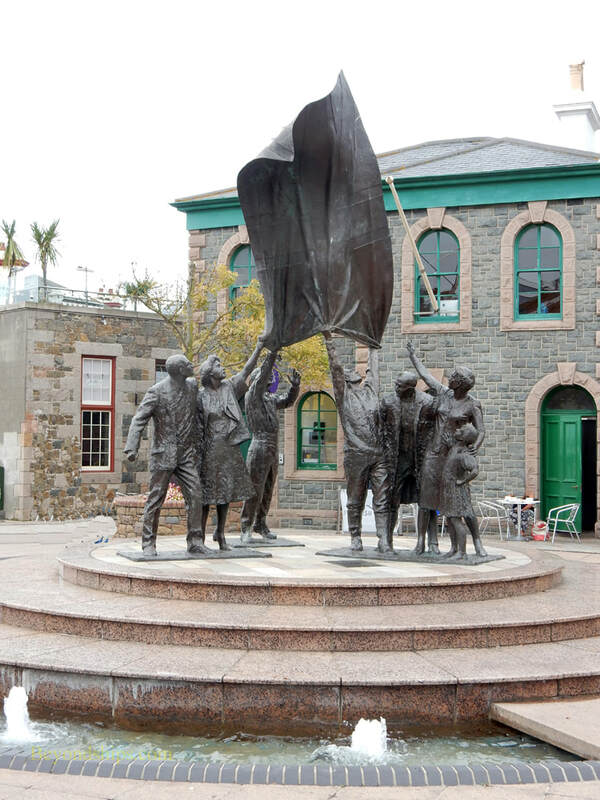 Liberation Square was created in 1995 to mark the 50th anniversary of the end of the German occupation of the island. Crowds gathered here on May 9, 1945 to greet advance elements of the British Army and Navy who had arrived to liberate the island. A British flag was unfurled from the balcony of the Harbor Office, now the jersey Tourist Office. A soldier took the flag across the square and unfurled it from the balcony of the Pom d'Or Hotel, which had been the Nazi headquarters during the occupation. The statue in the center of the square is by Phillip Jackson. The original concept was for it to be a line of civilian figures releasing doves of peace. However, as a result of objections that this concept was too remote from the actual liberation, the concept was changed to the unfurling of the British flag and it includes both civilian and military figures. Click here for Guernsey Overview.